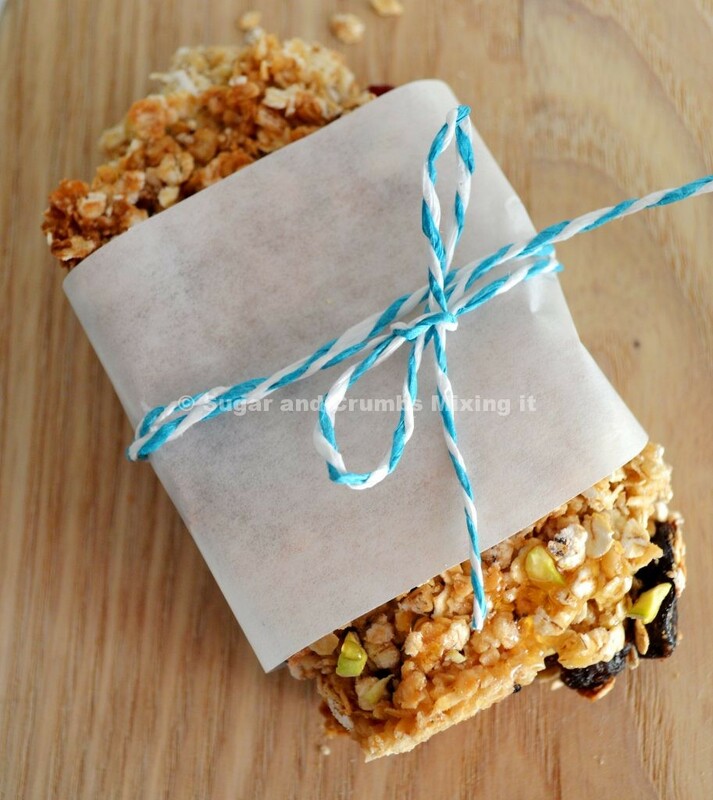 These homemade cereal bars are great fun – really easy to make, full of flavour, and perfect for a quick recharge, whether for breakfast or at any other time of the day. In this version, they’re made with Sugar and Crumbs Strawberry Milkshake Icing Sugar, dried cranberries and blueberries, and pistachios, but you can customise them however you like – try using another flavoured sugar from the Sugar and Crumbs range, or adding different fruits, nuts or chocolate chips. 1. Preheat the oven to 180°C (170°C fan). Measure out the butter, honey, Sugar and Crumbs Strawberry Milkshake Icing Sugar and brown sugar and microwave together, in thirty second bursts, until melted and smoothly combined. 2. Weigh out the porridge oats, dried fruit and pistachios, and stir through the melted butter mixture with a very small pinch of salt. 3. Grease a square brownie tin and line with baking parchment, then pour in the mixture and spread out evenly into the corners, pressing down with the back of the spoon so it’s all roughly level. Bake for 20 minutes. 4. Allow to cool in the tin, before lifting out and cutting into squares or bars. For ease, you might want to wrap each one in baking parchment or tinfoil, so you can just grab and go.